Kleber is starting his second year of sixth-form at the prestigious Lycée Henri IV and as well as worrying about the school year ahead, he must also find himself and his older brother, Barnaby, somewhere to live. Barnaby, known as Simple, is twenty-two years old but has the mental age of a three-year-old, an “i-di-iot” as he defines himself to anybody who will listen. When Kleber finally finds a flat share with other, slightly older, students who are seemingly willing to accept Simple, what seems like the perfect opportunity at first brings all sorts of new difficulties. How can Kleber juggle Simple, his school work, and his ardent interest in girls? How will his flatmates react to Simple’s antics when things get out of hand? And will his father, waiting in the background for Kleber to fail, get his way and return Simple to the institution that terrifies him so much? The theme of My Brother Simple is not in itself new: the arrival of someone “different” in ordinary people’s lives which ultimately changes them and their outlook on life forever has been visited many times by different authors. But this sometimes heartbreaking yet often heartwarming tale of the love and bond between two brothers stands out from the rest because its delivery is such a joy. Marie-Aude Murail’s writing is simple, her style fluid, but nonetheless charged with emotion and wisdom. The text switches back and forward from real life accounts to snapshots of how Simple sees life, with his beloved stuffed rabbit Mister Babbit coming to life. This elevates some of the potential seriousness of the tale, and makes it all the more heartwarming. My Brother Simple isn’t preachy and does not try to illustrate how to deal with people with learning difficulties. Yes, the reader will certainly feel compassion towards Simple, especially because of the despicable behaviour of his father, but the story does not aim to encourage readers to feel sorry for Simple or people in a similar situation. Rather, it is about celebrating the effect and influence Simple has on the people around him. Simple’s comportment encourages them to peel back the layers that they have covered themselves with to protect themselves, in order to accept oneself and not being afraid to show others who one really is. Because of his learning difficulties, Simple does not comprehend social graces or expectations of and from others; he only knows how to be himself, and that rubs off on the people around him. Simple being himself brings the “real” person out of each and every one of them. Some characters come out much improved and much happier, including Kleber (and Monsieur Villedieu is just wonderful), but some come out far worse. Simple’s influence also teaches them to look at others in a different light. 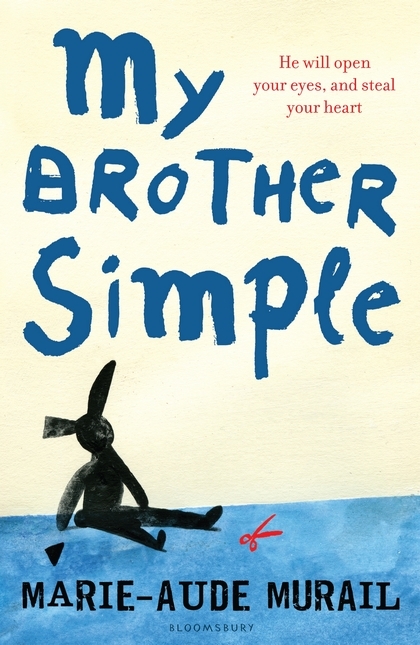 Finally My Brother Simple is a marvellous coming-of-age story, as the reader follows Kleber’s journey to independence, and witnesses his struggles, his doubts, his mistakes and ultimately his overcoming of all those problems to reach his goal: looking after his brother. My Brother Simple is moving and rewarding tale who will appeal to teens and adults alike. It is clever and funny, and an incredibly enchanting and uplifting read. I highly recommend it. I just wish we could see more of Marie-Aude Murail’s books translated into English, particularly her ingenious Miss Charity, inspired by the life of Beatrix Potter.